I did a tour of the Airbus factory in Toulouse in the summer of 2007, and I saw what became VH-OQA in the green but with a painted tail, which was the 1984 livery still. Obviously it was repainted into the then-new 2007 livery prior to delivery. Sadly photography was not permitted inside the factory so I was unable to snap a picture. But I did ask the question of the tour guide and she said it would be repainted. So that means that VH-OQA's tail, once it is repainted, will have seen three liveries! -EBS has come out of BNE maintenance in C27 Y224 config. Looks like row 6 is moved to second (smaller) business cabin while rows 38/39/44 were removed, while row 58 gains a pair of window seats. while row 58 gains a pair of window seats. They’ve actually just renumbered the rows (I assume to match the A333), so row 58 (previously row 57) has actually lost the centre set to make way for the enlarged rear galley. 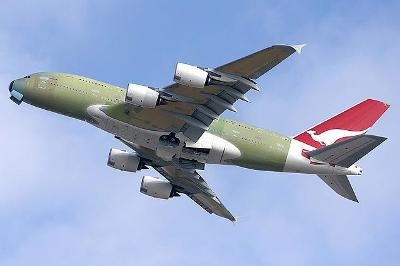 -OQA will be the next A380 to enter the paint shop departing SYD on the 14th of July. I think the one after would be the 3rd of September since QF81 will be operated by an A380 but there is no QF82 this day. In saying that, VHOQG will be the next A388 heading off to DXB via SIN on 16th of this month. OQG arrived in DXB last night for painting. OQI has been out of service for a couple of weeks at SYD. Similar pattern to OQG prior to repainting so maybe OQI is next to be painted? Is somewhat strange that it appears to be the younger ones being repainted first in DXB. I can only think this is because the oldest 4 will be the first to be refitted internally by Airbus and probably painted at the same time. Word the 1st B717 will be entering the paint shop soon. There could be another 1 before then. EBO has been in the hangar for a few days. Probably the likely next 332 to be reconfigured with new international config. About time, I saw NXK at Perth the other day and it's in dire need of a repaint. 332 VH-EBD out of BNE hangers. Has it been WIFI'd ?. Looks like -EBJ has gone in. Scratch the -EBJ bit..its back flying after 2days on the ground. QOX in 2016 livery and returned to service today. VH-EBV is also in Hangar 3 at BNE. Not sure if it is also getting the 27J/224Y reconfig. I flew -EBC a few nights back from PER to MEL and I don't believe it had wifi, asked the crew and they seemed clueless. NBN Satellite is targeted to the landmass and won't cover the Tasman Sea. Whereas VAs Gogo 2Ku has a wider spread but slower speeds. In the 332s I thought I had read that the first aircraft was still in test phase. Last edited by undertheradar on Tue Jul 31, 2018 9:10 pm, edited 1 time in total. The aircraft is fitted, but maybe not 'active' yet. VH-EBV has been in BNE since 24-Jul so will possibly by the 3rd reconfig. Flew home on QF72 tonight on -EBB, there was no onboard signage anywhere on-board about the wifi. Again I asked this set of crew about this particular aircraft and wifi and they said it wasn't fitted. They were also domestic crew staffing this QF71/72 rotation. Last I heard either -EBG/L was due next into the hangar for 'domestication'. Even with -EBO/S converted into the new A332L configuration the Skybed pair are still regular on QF107/108, I suspect it'll take a while for the schedules and forward booking to aclimatise to these new configuration. Really there is only 3 and half months to do them as by early December QF will have all widebodies in the air being the busiest time of year. I have my doubts that all will be done by end of the year. I have also noticed an increased amount of A330 flying between PER and SYD and MEL. The pilot issues they have are certainly starting to bight them in the backsides, redeyes on Saturdays are now A332's and have been since late June, we are also get more A333's here as well. Some of the scheduling as well has been extremely tight, there was a AKL-MEL than doing MEL-PER schedule with a 15 minute turnaround a couple of weeks ago, there was a east coast to PER flight then doing a PER-SIN with a 30 minute turnaround both being unrealistic turn times. On top of this over the past few week the on time performance and delays out of SYD & MEL havent been great, though this is not just affecting QF but all domestic carriers. I have also noticed that the 744 on SYD-PER (581/582 rotation) has only arrived in PER on time once and departed from PER late everytime, the average delay on these flight has been at least an hour. I shouldnt complain too much about these delays as the other day I was on the ramp at Gate 47 when the Qf 744 rotated right in front of me, what a sight. A couple of posts over the last couple of pages here say that -EBB and -EBC have the wifi humps fitted..Not entirely sure about -EBD though. ... There are approx total 71 B737s (which are getting 'humped' at a steady rate). From original announcement when EBB was announced it was under trial for a period, so don't believe active on any 332s. 71 737s on Aus register, plus 4 on NZ register which are expected to come across. How many 1984 liveries left now? Do those 330 turn times include towing from international?! I wonder if they may need to keep the 744s a bit longer to support the domestic flying, until they pilot issue on the 738s is resolved? Could be good over high season across the Tasman and transcon. Are there any potential hour limitations on the 330 tech crew? I believe there are significant shortages of long haul cabin crew with many trips being given to short haul crew. Good work as always qf789 and moa999. The A330 fleet is currently getting really decent utilisation, all frames are currently very active with the exception of -EBV and -QPF which are both currently in BNE. Of note also is the repainting of the A330 fleet into the silveroo livery has come to a complete standstill. -EBL did a charter from DRW-NRT-DRW yesterday guessing this was ADF related. There's been an increased amount of domestic A332's doing east coast to Singapore services the past couple of weeks. QF71/72 being operated by a mishmash of configurations. Yes, the updates are very much appreciated! I had a flight booked on QF38 in October which has been cancelled, possibly the shortages are starting to bite? I was on VH-EBS for QF23 on Sunday 12th of August. Apart from the 2 hour delay, part of which was late arrival of aircraft but most of which was winds in Sydney, it was a great flight. I've got to say, thank god for the extra toilet. I was in 4K directly in front of it and as much as I normally avoid being near the toilet, it actually didn't disturb me at all. It's certainly much better than everyone fighting over the 1 at the front! Yeah I agree 100% for C28 Y243 birds to go long-haul, they certainly need this toilet. Glad you had a great one. -EBV seems to be taking a long time to reconfigure. -EBG/L have been doing a lot more domestic flying the past couple of weeks. Also at what flight time does the flight have to be operated by a A332L or A333? I'm guessing KIX, PVG and NRT can't be operated by a domestic/regional A332. So I'd expect it out any day depending on what other maintenance was done, and whether it was worked on at the same time as EBO. Just an observation.. A332 -EBG looks to be 'hanging' at BNE the last couple of days. Maybe in for the conversion/refit to 28J suites/243Y ipad seats...and maybe wifi hump as well. What I found most interesting is that purchase of slots is given at $35 million at cost. I thought it would be higher but Qantas probably bought some of their slots a long time ago. Slots that are received through the allocations process at most airports are free - it's secondary-market purchases that are much more likely to attract the big bucks. Yep I believe she's finally in for 'domesticisation' after a long career flying ULH routes. Believe -EBQ is next into the hangar for A332L conversion at this stage. Thanks for that I have noticed -EBQ been very BNE focused with its flying recently...probably waiting for -EBV to exit the hanger.